Only 8,869 Kilometers! This Dodge Challenger delivers a 6.1 Liter engine powering this Automatic transmission. STANDARD PAINT, PWR SUNROOF, MYGIG MULTIMEDIA SYSTEM W/NAVIGATION -inc: AM/FM stereo, 6-disc in-dash CD/DVD changer, MP3 playback, hard disc drive, GPS, touch screen display, aux audio input, UConnect hands-free communication, auto-dimming rear view mirror w/microphone, universal consumer interface, Sirius satellite radio w/(1) year service. BRILLIANT BLACK PEARL, 5-SPEED AUTOMATIC TRANSMISSION W/AUTOSTICK (STD), Variable-intermittent wipers, Tire service kit, Tip start, Supplemental front side airbag, Supplemental front & rear side-curtain airbags, Speed-sensitive pwr locks w/satin silver lock knobs, Speed control, Solar control glass. 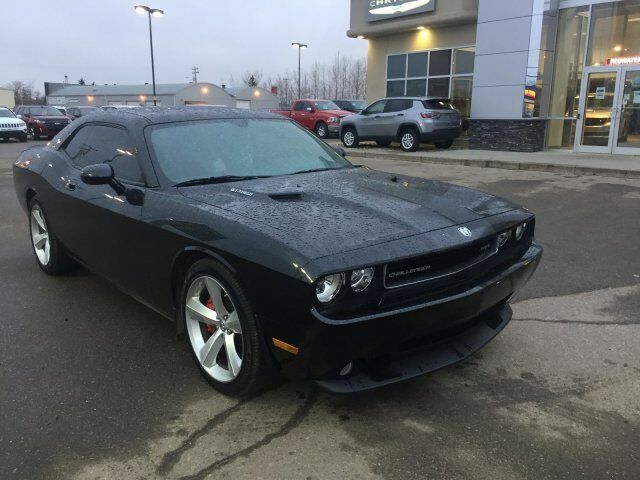 Come in for a quick visit at Redwater Dodge, 4716 48th Ave PO Box 407, Redwater, AB T0A 2W0 to claim your Dodge Challenger!